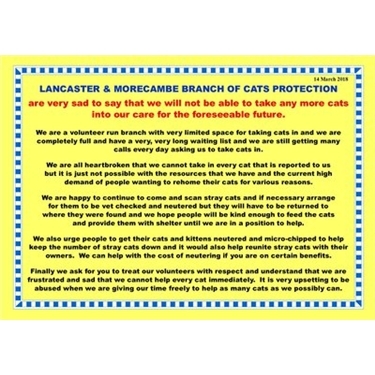 Sadly we have to announce that we are unable to take in any more cats at present as we do not have space. We are still able to come out and scan any stray cats to check if they have owners and to arrange vet checks or neutering but they would have to be returned to where they are found. We are full at the moment and have a very long waiting list of cats waiting to come to us. Please be patient with us at this difficult time as we are doing what we can to help. Please also consider having your cats and kittens neutered and microchipped as this helps to reduce the number of strays and helps us to reunite missing cats with their owners. We can help with the cost of neutering if you are on certain benefits so please contact us on 01524 850112 if you would like to discuss this. We are also still urgently looking for fosterers so, if you think you can help with this, please call 01524 850112 and leave your details and someone will get back to you to discuss it.